Discussion in 'Show off' started by Stigern, Apr 2, 2016. So, after some testing and failing I got my first successful print using HT filament from Colorfabb. 0.3mm layers, 0% on fan. 80% FR. I'm guessing stock parts for BB Pro are in ABS? So this should withstand more heat. Mike Kelly, Steven Burns and Rob Heinzonly like this. 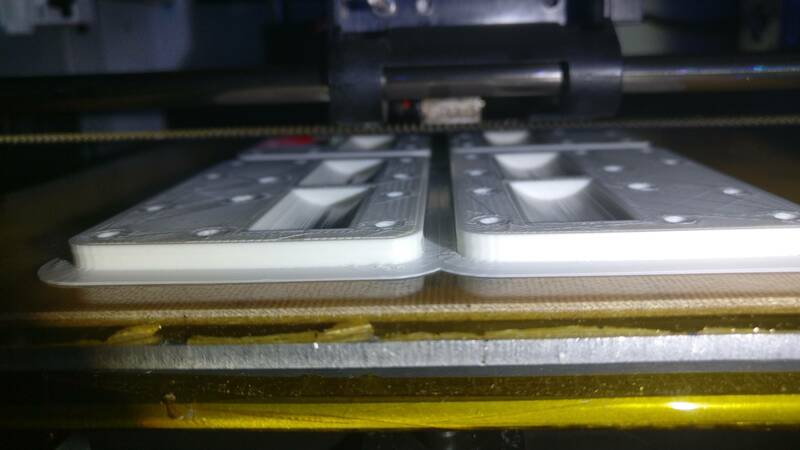 Thanks for sharing this, printing the sidefan holders with a more durable material is on my to-do list. Yeah, I'll keep these in spare, until I see deformation on the stock ones. But I'm not 100% sure HT is better than ABS at heat resistance. Maybe someone else knows? How is HT to print with? Those prints certainly look pretty good. I need to print some things that will withstand regular dishwasher temperatures, and anything that's less of a pain than ABS would be ideal for that. Warping on HT vs ABS I'm not sure of yet, only had it happened to one part, but that was printed with 110C on bed instead of 120. I think I need to print larger parts before I can give any good answer to that. Also ran it at 100% FR no problems. Hi, I know the topic is old, but I just registered this moment to be able to view the images above - really nice. Unter the "Additions" Tab check "Use Skirt/Brim"
Your prints look good. 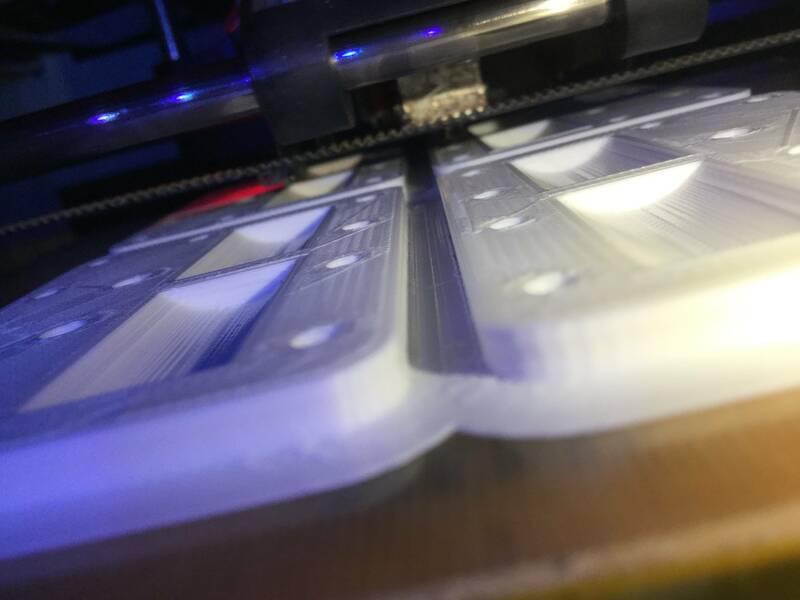 I've printed maybe 8 kg of HT and I'm a big fan for temperature resistance and toughness. The downside of course is the stringing like all polyesters. For what it's worth I almost always prefer a skirt to a brim. Both are good for letting the flow even out and giving time for blobs to fall off the nozzle, but I rarely need the extra adhesion from the brim since HT is pretty low warpage. For what it's worth I almost always prefer a skirt to a brim. A brim connects to your print like the brim of a hat. A skirt has a gap between itself and the print. 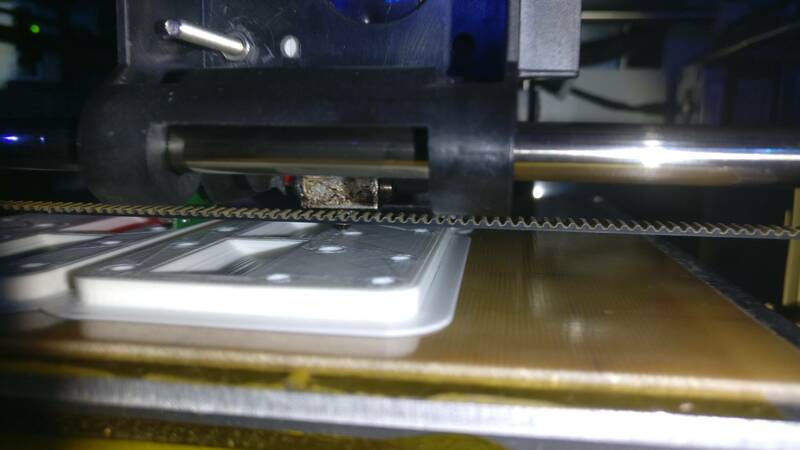 It doesn't help with adhesion but it does let the extruder finish priming, may get rid of dark and crunchy stuff that's been cooking in the nozzle, and gives the nozzle time to shed itself of any blobs that are hanging on the exterior of the nozzle. In some of the slicers you can make the skirt many layers tall as a sort of windbreak. I assume that's mostly as a desperate measure with ABS when warping is out of control. I stopped using a brim or skirt, instead adding a separate small, square, 1-layer-thick model into the mix which will be first to print (moved around depending on print options). This small print gets everything primed and lets me adjust with babystepping to get the perfect nozzle height (which often seem to need to be slightly tweaked for different layer heights. I can't do it for every model as, with vases you can's have two models (i'm thinking I probably could actually, could be a bad assumption). Anyway, just wanted to share my alternative method. Brims and skirts can help for some models for sure, but seems for me to be a rarity; i.e. models with very small surface area on the bed.